I have finally reached the last day of our trip to Istanbul, about a month after I started, and for the first time in a while it’s a short one! 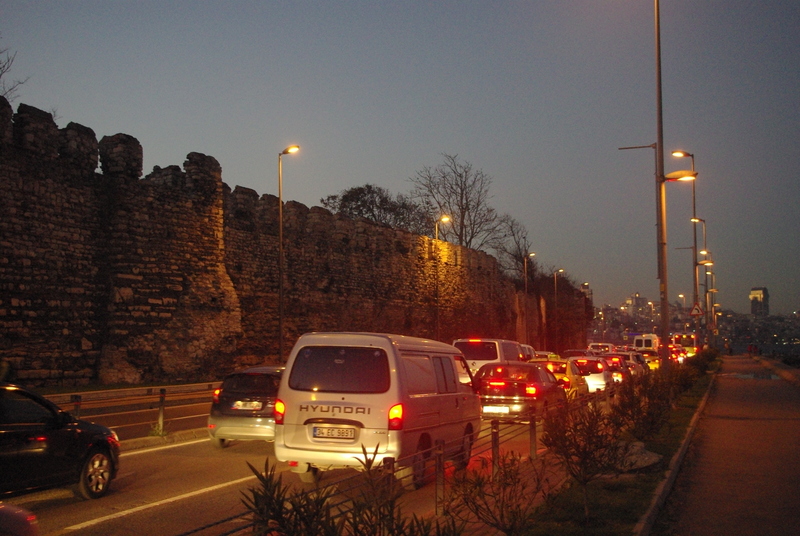 Our final day in Istanbul was the shortest day as our flight was to leave mid-afternoon, so any plans to visit the Rumeli Fortress or see the non-European side of Istanbul had to be shelved. What we ended up doing was something that hadn’t been on the itinerary. We would find the city walls. 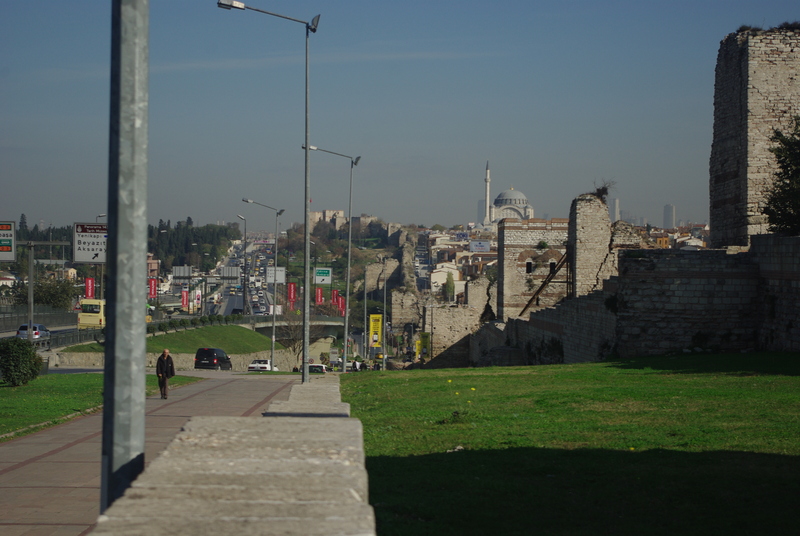 When we had first arrived in Istanbul, we glimpsed many remnants of the old city among the flash and colour of the new city, and what stood out most were massive stone walls that stood on either side of the tram lines. I’d read about ancient walls when researching the trip, but the locations seemed unclear, which is possibly because they are huge and as we were to find out, have been all but absorbed by the city. So following a final delicious Mediterranean breakfast at our hotel we headed out to catch the tram we’d arrived on, and hopefully spot the walls in time to get off. We didn’t quite manage that, but after a bit more travelling we made it to the walls. Up close they still looked massive, though we don’t know enough about the specifics of wall architecture to be able to say whether they were Roman, Byzantine or Ottoman, though I suspect they are probably a combination of all three. Strangely, though, as we walked along the walls there didn’t seem to be any gates charging money to enter, or people with maps or anything that would indicate that they are an historical site. We did find a gate but all it seemed to be protecting were plastic chair and tables. Further along we found a pile of stones low enough to climb up on the wall and my partner had a go, perching on the narrow stone ledge. As he sat there, a local holding a plastic bag with a mysterious yellow substance joined him, chattering away happily and breathing in the contents of the bag. After a little while my partner climbed down, under his new friend’s friendly gaze, who waved us goodbye as we continued along the wall. As we walked along we spotted someone between the crenellations on one of the towers, though how he got up there I couldn’t work out. Crossing back to the city side we found ourselves in a somewhat dodgy area, the first indication being a dead cat in a garden. We headed back towards the tram stop we’d arrived at, walking along a street lined with the crumbling wall on one side and crumbling houses on the other, mixed with workshops and small storehouses. The only people we saw were a group of old men trading bullets and two other tourists, who also seemed to be in a bit of a hurry. At intervals the wall was crumbled or low enough for people to climb up, so along the battlements we saw men with suitcases looking lost, others chatting companionably and still more looking down at the city below. It seemed as though the walls were something like a public park, where people wandered about during the day and where somewhat dubious activities possibly occur at night. Despite this, the arches were still graceful and the size and grandeur of the walls were still impressive, and made it possible to imagine the confidence they must have inspired in those who lived on the city side years ago. We read later that the old Roman walls were placed quite a distance from where the city was at the time, and people scoffed when the Emperor said the city would reach them in time. 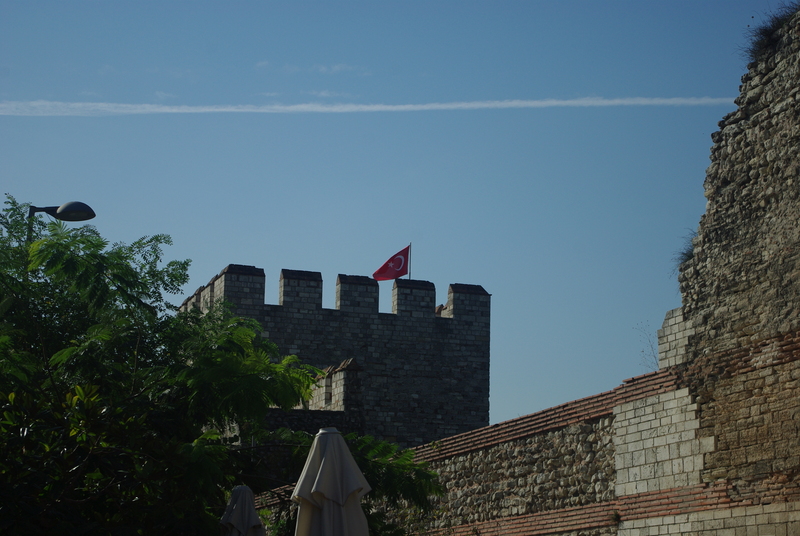 I don’t know if they were the walls we saw but I think it’d be impossible to set limits on a place like Istanbul. After a rest and drink in the shade of the walls, we headed to the airport, and the end of our visit to Istanbul. Having had about a month to think about the trip, what I remember most strongly was how my senses were so vividly enlivened, every day. 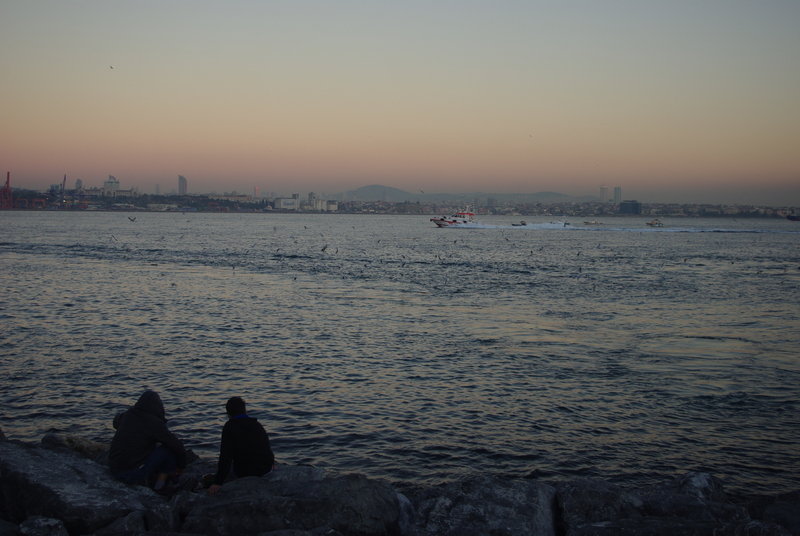 In regards to colour, taste and sound, Istanbul envelops you, and then keeps drenching you in yet more richness. I loved the sweet dried figs and apple tea, the bright sun on ancient buildings, the haunting call to prayer and the endless busyness of the people who live and work there. I was also confronted by the insistent salesmen, lack of women working almost anywhere, the sudden, empty, threatening streets and the smog, which was quite a contrast after Sweden. There was also a multitude of cats, who got everywhere and I suspect actually run the city behind the scenes. I’ve always liked to imagine cities as living things with characters, that are awakened by millions of lives and never ending activity, though there are only a few places I’ve been where I’ve felt that. 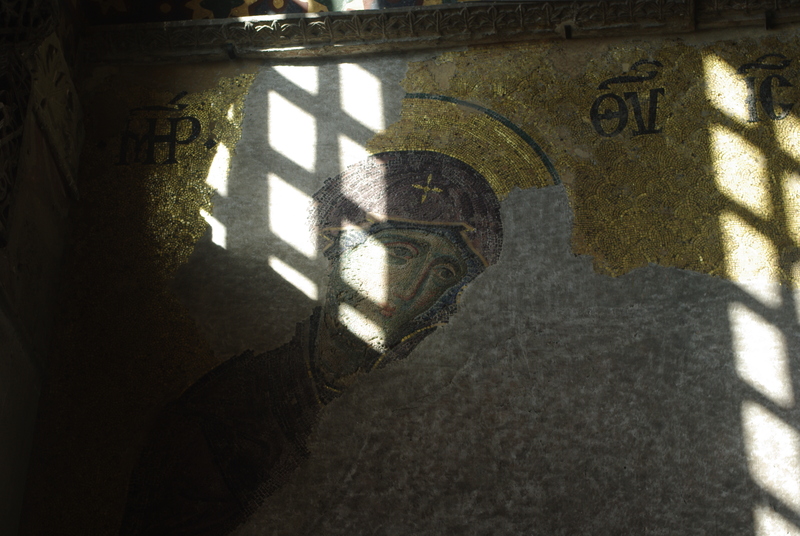 Istanbul is one of them, and perhaps has the most character of any I’ve been in so far. I would very much like to meet her again. Before I started to write this I had a look at the itinerary and thought, ‘Hmm, that doesn’t look like much’, and so I asked my partner how we spent our second day. Then he told me, and I remembered. We did quite a lot in fact. The morning began as planned (after a delicious breakfast including dried figs which I now miss) with a stroll to the Istanbul Archaeological Museums. 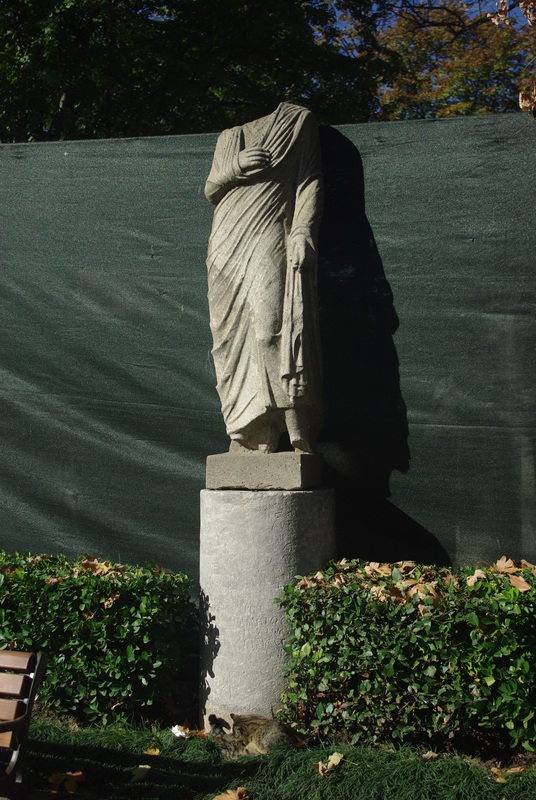 As with many places in Europe the grounds were scattered with assorted columns and statues that would have been on display in Australia, another example of how commonplace history is in the ‘old world’. Inside the first museum we saw items from the Ancient Orient, including, excitingly, the Hittites and Babylonians. 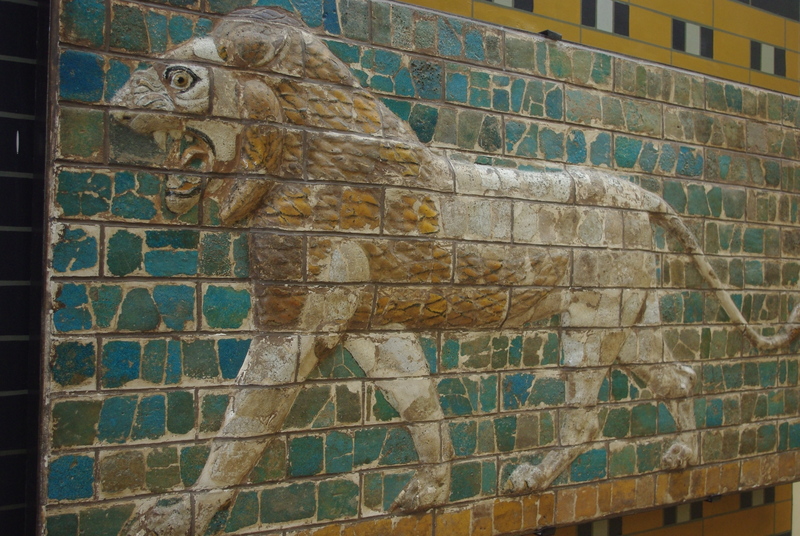 Lion statues and reliefs were abundant, including the Ishtar Gate of Babylon, which I am amazed has survived in such good condition. I can imagine the impression they must have made all those years ago, as they still do today. More excitement came from the various cuneiform tablets, including one with the treaty from the battle of Kadesh. This was between Ramses II (or the Great, I think he’d have preferred that) of Egypt and Hattusili III of the Hitties, and is the earliest known international peace treaty. Excitement! For further information about why this is exciting to me, see the Rameses series by Christian Jacq, which I adored as a child. The second of the museums was the main building, which included a lot of Greek and Roman items, including the Alexander sarcophagus. It wasn’t used by Alexander, who as far as I know was preserved in honey in a glass sarcophagus and was last heard of in Alexandria (or possibly Broome, Western Australia), but features his image alongside the former occupant, who was probably a governor of Babylon. It’s a beautiful monument and amazingly intact with traces of paint that give an idea of how colourful it must have been. The detail is also very fine, down to the expressions on the horse’s faces and the cloaks that look as though they’re about to ripple in the wind. There were many other sarcophagi, mostly from a burial ground in Sidon and carvings from tombs, including one of a pet dog called Parthenope who was deeply missed. Further exploration revealed Greek and Roman statuary, mosaics and part of one of the snake heads from the Delphic column. By this stage we were getting hungry so we left the company of ancient relics and headed into the sunshine so seek out some food. Just around the corner was the next item on the itinerary, the Topkapi Palace, as well as a cafe, shops and lawns full of people enjoying the sun. There were also quite a few stray dogs lazing in the sun, and even more cats wandering about or watching passers-by with typical cat indifference. Food eaten and energy replenished, we headed into the Palace, avoiding the long queues due to the multi-pass tickets we’d bought the day before. Already proving their worth! The Palace is massive, and without a map or a guide we are a bit of a loss as to where to head for first. The one criteria we mostly stuck by was avoiding the places that had long queues, which served us well. 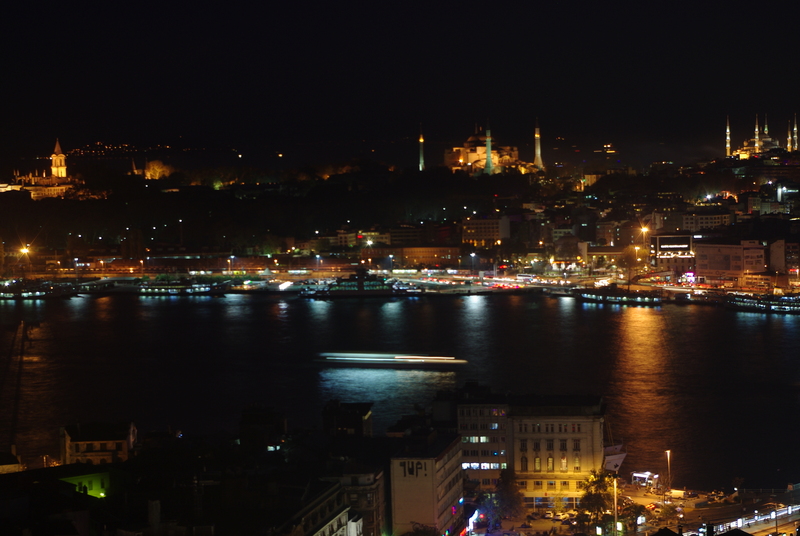 For a while we wandered, peering into kiosks and out over the city and the Golden Horn. It was warm and sunny and a very pleasant day to get spent wandering ancient rose gardens and stepping into cool, dim and beautifully decorated rooms at our own speed. I can imagine spending many hours sitting comfortably on one of the couches under the stained glass windows, happily reading books and possibly even being waited upon. It wouldn’t be too bad at all. We also explored the Harem, which gave us more of an idea of the day to day life of people living in the palace. 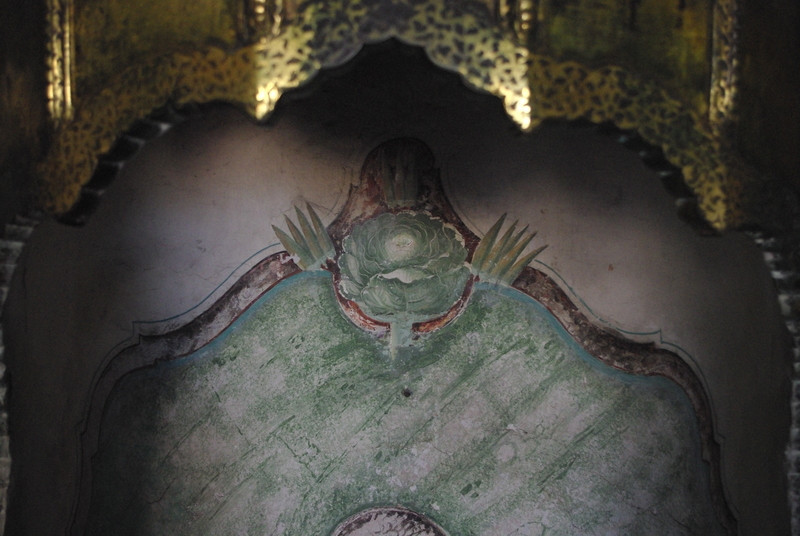 The hierarchy of the Harem was made clear by the placement and opulence of rooms, though we only saw the fancier ones, belonging to the Queen Mother, Princes and Chief Wife. 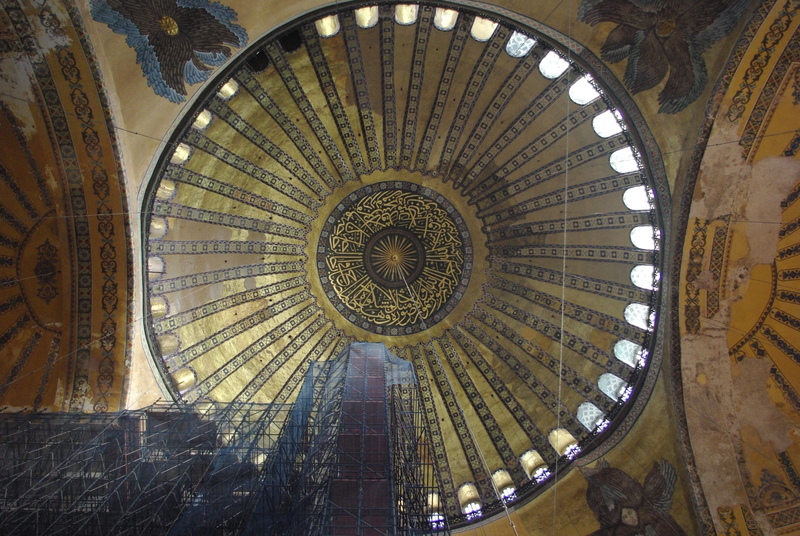 Yet more examples of fine tiling, paintings, stained glass windows and graceful architecture. Plus a cabbage in a fireplace, for which there was no obvious explanation. After leaving the Palace I recalled that there were supposed to be Byzantine ruins somewhere nearby, so we set off in search of them. The search was to no avail, though it did result in delicious pomegranate juice and more wanderings through the ancient streets. When we had been peering down at the city from Topkapi Palace I’d spotted Galata tower, tall and conspicuous among the tenement buildings and wondered what the view would be like from up there. 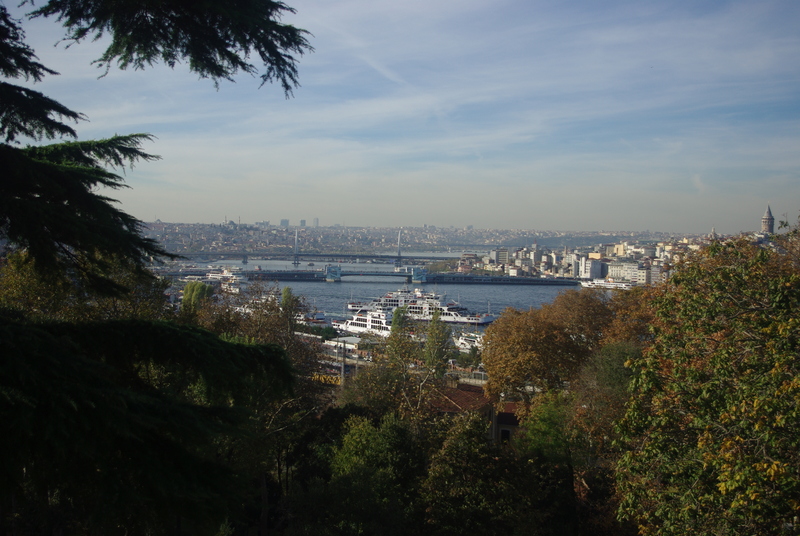 So as the day began to trail away we headed across the Golden Horn on a tram, and then up the hill on foot. I would have preferred it the other way around to be honest, as it was a very definite hill that was not playing around with gradually sloping sides. The streets of the hill were also labyrinthine, with scuffed signs to the tower, though in the end we followed a couple who were obviously tourists and seemed to know where they were going. When we made it to the top the tower suddenly appeared, soaring upwards, and at it’s base was a long queue curling around out of sight. Resigned by now to queues, we joined it and slowly made our way back to the tower. The highlight of the wait was a popcorn seller, with a metal tray that looked something like an old fashioned bed-pan, which he shook over a fire to pop the corn inside. A with some other salesmen I’d seen in Istanbul, it seemed as though he’d happened across the popcorn tin by chance and then discarded his job at the local shop to hit the streets. The interior of the tower was a bit of a surprise. On the outside it was an ancient stone tower, and on the inside was a gift shop and an elevator, plus a restaurant near the top. I think you can take the stairs all the way to the top, if you really want to. Three flights were enough for me. By the time we reached the top the sun had set and all around us were the lights of the city. Back across the Golden Horn I could make out, from left to right, Topkapi Palace, the Hagia Sofia and the Blue Mosque, huge and lit up even in the busy city. It was an impressive view from every angle so we took a while walking around, experimenting with our cameras and getting in the way of all the other people doing the same. We got to the ground feeling quite hungry, but before we left this side of the Horn there was one place that had been recommended to me, so we headed off to find another tram. Taksim square, when I first saw it, seemed to be designed for large gatherings of people, and situated in the heart of Istabul it’s no wonder that it’s been the location of demonstrations over the years. It’s a huge, open area, surrounded by streets going off in all directions, and in the middle stands the Monument of the Republic. The area there seemed blessedly free of (other) tourists so we got a feel for a place for the locals, inhabited by a locals, who were being themselves. By this stage we were getting very hungry and there was another recommendation that I had to follow, which happened to be back across the Horn in Sultanahmet, around the corner from the hotel. So we caught a funicular tram heading down the hill, which was fun, and then more mundane ones as we reached familiar streets. The restaurant turned out to be very good, and my partner got to experience a local dish which is presented in a clay pot on fire. The pot is sealed at the top with foil and the server makes a great display of tapping the sides, and then dashing the top onto the ground. Watching the show and carefully stepping over the shattered clay, a few other tourists also decided to try it, so we got a few more displays as the night went on. Full of delicious food and drink (yes, including more apple tea) we headed back to the hotel and prepared for an early wake up the next day, in order to catch the bus for a day trip to the place where many Australia’s make their pilgrimage – Gallipoli. In the next update will be Gallipoli, from the now calm beaches to trenches and places that look far too small to have been the resting places of thousands of people. How do you start a post about Istanbul? How do you sum up a truly eternal city, where cafes and druggies overun ancient walls and syrupy pomegranite juice can be bought for 1 lira in the shadow of towering mosques? I suppose I’ll start at the beginning, which for me and Istanbul, was when I stepped out of the airport. It was a slap in the face with cacophony, people bustling and shouting and herds of cars competing for noise and speed, which you have to navigate by pushing through. Under this chaos runs a public transport system that works really well, thankfully, so getting away from the airport and into the city was easy enough even late at night and post flight. And anyone who’s been on a plane knows how wonderful it is to collapse on a bed after a flight, which it most definitely was. Yes, it was only a 3 hour flight but time is relative when it comes to airports and aeroplanes. 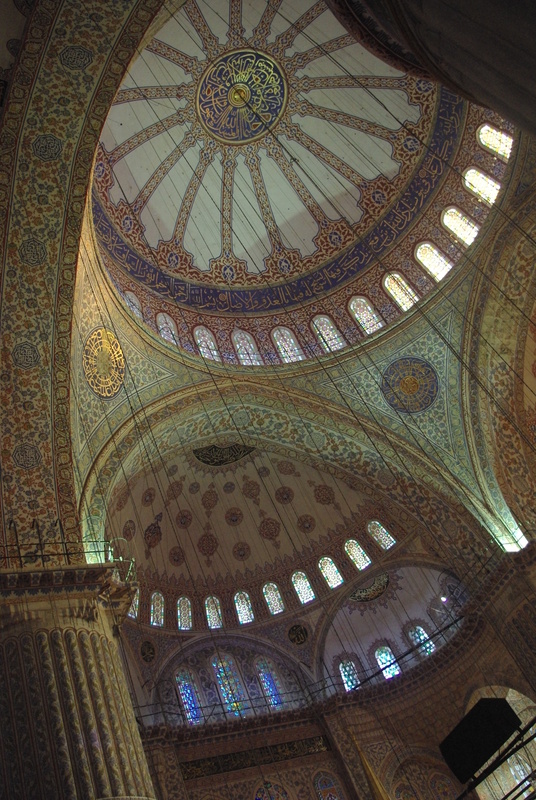 A few weeks prior to leaving I’d put together an itinerary for our trip and had asked for advice about what to see as there is rather a lot in Istanbul. Also I like lists. So armed with the list we set out eagerly on Saturday for our first exploration (after a very pleasant Mediterranean style breakfast, which would soon my accompanied by very pleasant Mediterranean sun), and headed down the road to the Hagia Sofia. Well, there was a short detour when we found some ruins and dashed over to photograph them and wonder who left them, and point out the numerous cats wandering about. The Hagia Sofia is very big, and grand, though as she is old on the outside it’s her size and the motley of building styles that I noticed most. Eschewing an audio guide or one of the persistent human guides that lurked around the entrance, we went in, stepping over the worn marble doorstep and then staring around at the golden tiled ceiling. The tiles still glittered a bit in the morning light. Then we went into the main hall, and had to crane our necks to take it all in. Despite having construction work going on, mosaics missing and bustling crowds, she seemed as stately as a queen and though I wanted to avoid this cliché, bigger on the inside. There’s something about a dome that stretches out and upwards. I was reminded of the Pantheon, probably my favourite building, which is now less colourful and also smaller, though just as stately. 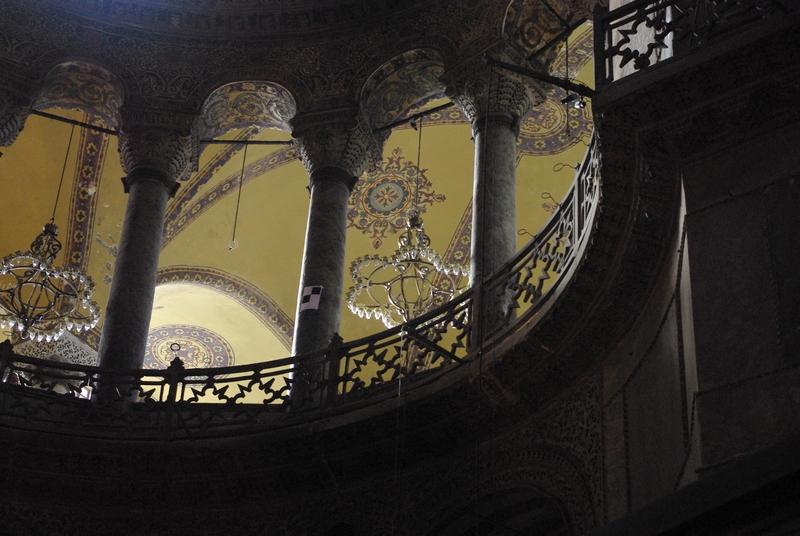 Something I didn’t expect when I’ve imagined visiting the Hagia Sofia in the past, was, well, the signs that she has been rebuilt a few times over the years. 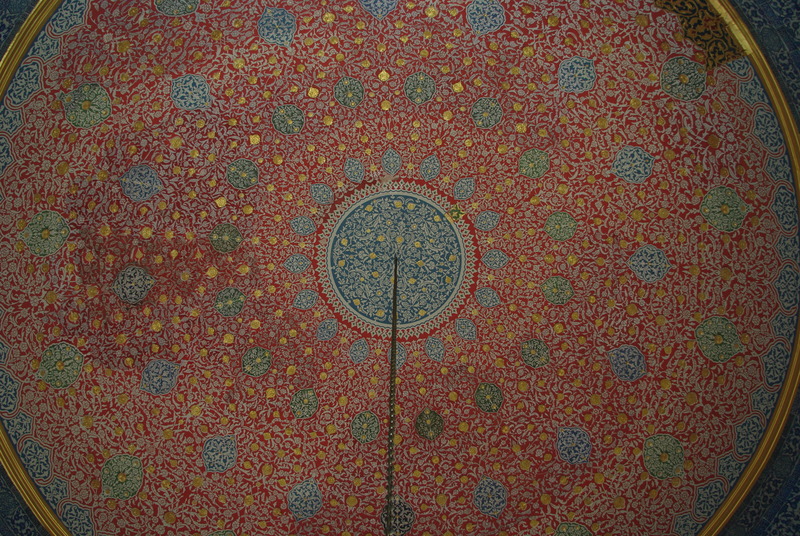 The original parts, under arches and on a few walls, are covered in delicate in mosaics and the dome and most of the walls are painted in bright colours, with some sections whitewashed. There’s also some Viking graffiti somewhere, though we couldn’t find it, plus more recent scratchings. She shows her years and there are signs all over of the millions, possibly billions of people who’ve walked her halls. She carries her age very well, still standing after 1476 years and drawing masses of crowds to worship her in their own way. 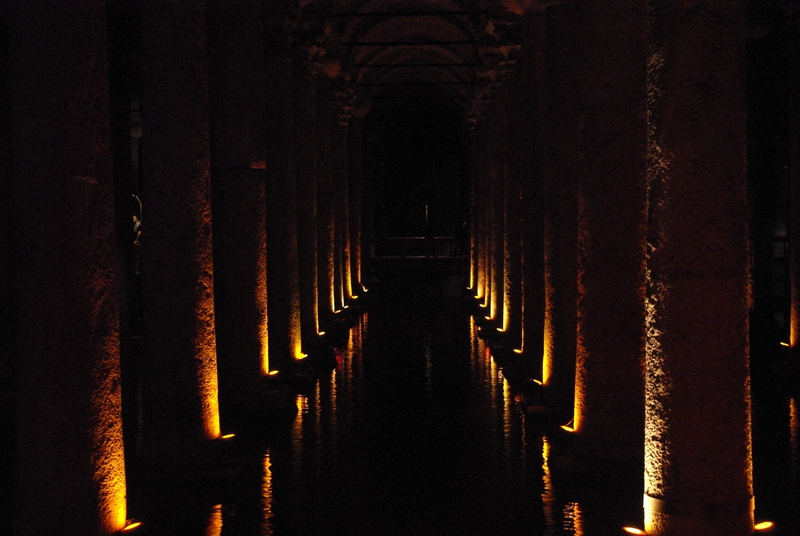 After pulling ourselves away from the Hagia Sofia, we descended into the Basilica Cistern, the popularity of which would have puzzled the builders I bet. It’s basically a large columned hall for holding water, which doesn’t sound like much and there are hundreds of them under Istanbul, but none as big. Here are some stats from Wikipedia: approximately 138 metres by 64.6 metres, about 9,800 square metres in area – capable of holding 80,000 cubic metres of water. The ceiling is supported by a forest of 336 marble columns, each 9 metres high, arranged in 12 rows of 28 columns. So yeah, big. Nowadays the water is about a foot deep and full of goldfish and carp, and the occasional coin, and the room is lit by lights at the base of the pillars, dimmed and creating a cavernous atmosphere. 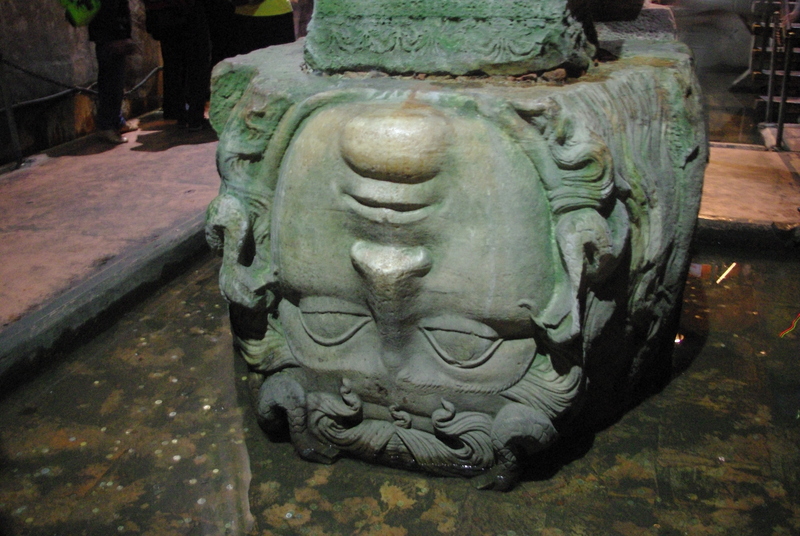 The most famous parts of the Basilica are probably the two heads of Medusa, which support two pillars and are mysteriously upside down and on the side. There are theories as to why they are there, and the one I like best is that in those positions Medusa’s power is lessened. Why they dunked her in their water supplies is another question that is unanswered. Ascending to sunlight again we decided to have some lunch, and my partner was told for the first (though not the last) time that he looked Turkish. I was also complimented on my handy bread-tearing skills and had some apple tea or elma çayı for the first (and also not the last) time. 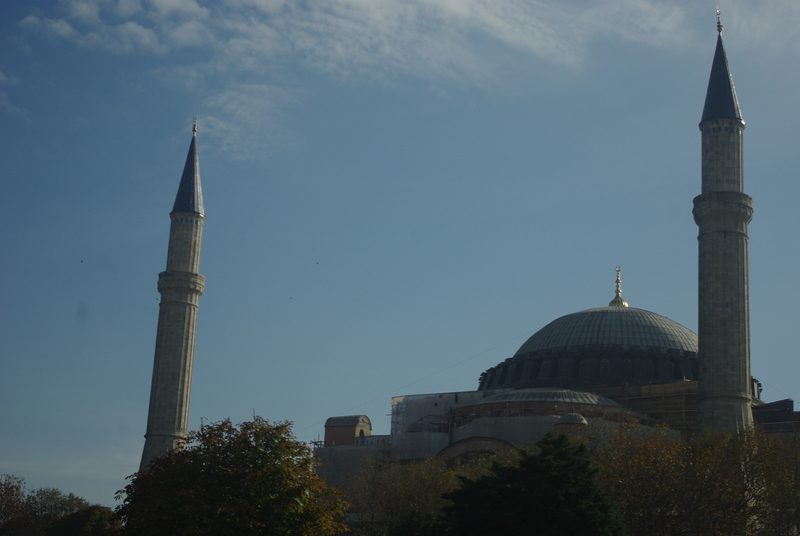 When preparing the itinerary I’d read that you can see remnants of the ancient hippodrome in the area near the Blue Mosque, and that it is often confused with a park. So bellies full of food, we wandered over to the supposed location of the hippodrome, and it was quite possible that if I didn’t know what to look for we wouldn’t have known it was there. As with the hippodrome in Rome, the huge, stretched oval has somehow maintained it’s shape, and has been subsumed into the landscape. Where the chariots once thundered along are gardens and benches, and somewhat more obvious are three monuments that have survived. Two obelisks and a column. At the far end is the walled obelisk from the 10th century and that was once covered in bronze and is now bare stone, though it was not as interesting as the other obelisk. The other one was carved in 1490BCE on the orders of Tuthmosis III and had stood in Karnak before being shipped around the various locations before being used as a monument in the hippodrome. Though it looks a bit stunted today and could be overlooked next to the obelisks, the serpent column was the most interesting of the three in my opinion. 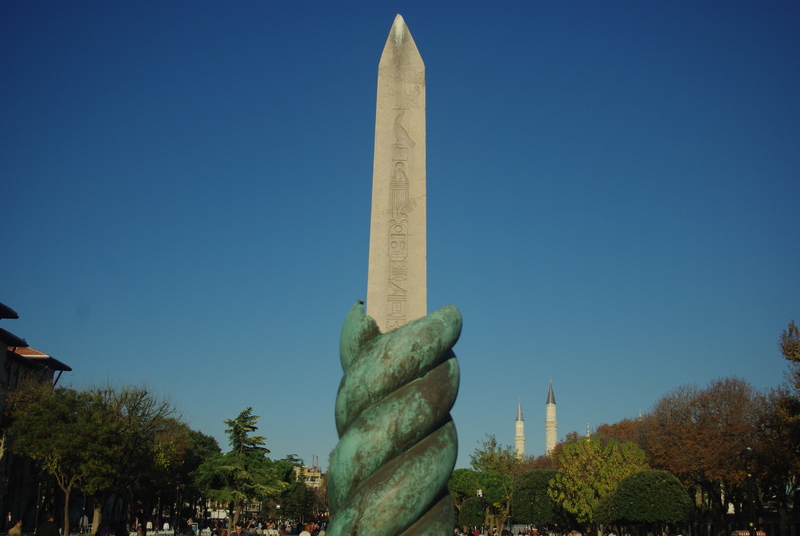 It was made to commemorate the battle of Plataea, in which an alliance of Greek cities fended off the Persians, and was apparently made from the melted down bronze weapons of the defeated army. It originally stood at Delphi, then was brought to it’s current home by Constantine I. The three snake heads have been broken off, and I was excited to see one at the museum the next day, looking quite fearsome. From there it was a short walk to the Blue Mosque, the final item on the itinerary for the day (yes, the day actually went according to plan, amazingly). I was prepared for the headscarf requirement to enter, and when we entered the forecourt got myself tucked away and wasn’t quite prepared for how I felt afterwards. Most readers will be aware of my opinions regarding religion, in particular in relation to women, but as soon as I wrapped the scarf around my head I felt nondescript and like I fitted in. I suppose while in Sweden, and even more so in Istanbul, I’d become used to head-scarves and on occasion felt a bit conspicuous with my hair all over the place. Maybe also a sense of anonymity. I’m not entirely sure yet, though all this doesn’t mean it’s going to be a habit, but it was unexpected. My partner on the other hand was greatly amused by my get-up and insisted on commemorating it with multiple photographs. When we worked out that we couldn’t enter by the main entrance (my partners mostly joking suggestion that we pretend to pray didn’t quite sit right in the circumstances), we lined up for the tourists section. Before entry we took off our shoes, I wrapped up my head again and we walked quietly inside the Mosque. It was, in one word, beautiful. 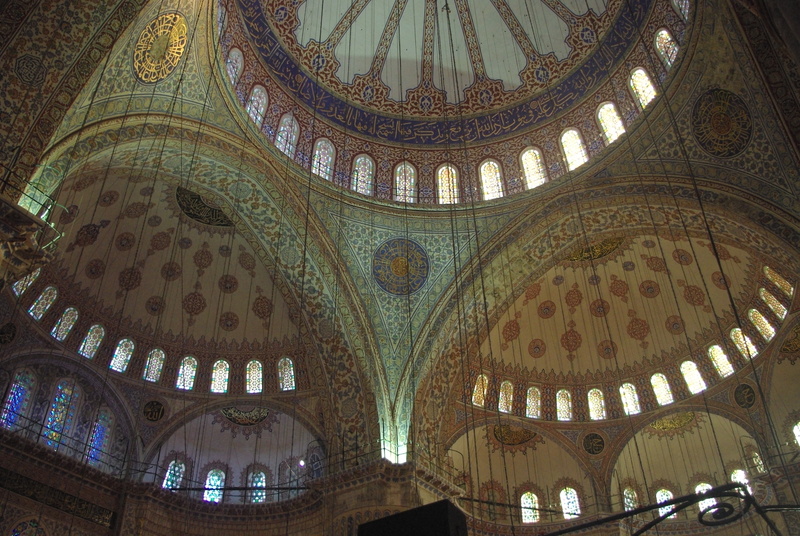 While the Hagia Sofia was grand and colourful, the Blue Mosque was a stunning stretch of tiles in all directions, mostly blues, reds and yellows. I stared about for a while, snapping away. It as magnificent, and while I will mention that the area where the women could pray was at the back, in a tiny fenced off section, I’ll reserve my comments on that for another day. So what did we do after such a busy day? Why, walk around the penninsula of course. I’d glimpsed the Sea of Marmara a few times and wanted to have a closer look, so we wandered down through the twisting streets below the Blue Mosque till we reached the water side. A road runs along the coast, separated from the sea by a footpath and piles of rocks where fishermen and cats were enjoying the sinking sun and the occasional fish. As we walked smoke from fires in the rocks and possibly smog caught in my throat, and the lights, roar of cars and general busyness reminded me that this was a very big city, and had been for a long time. 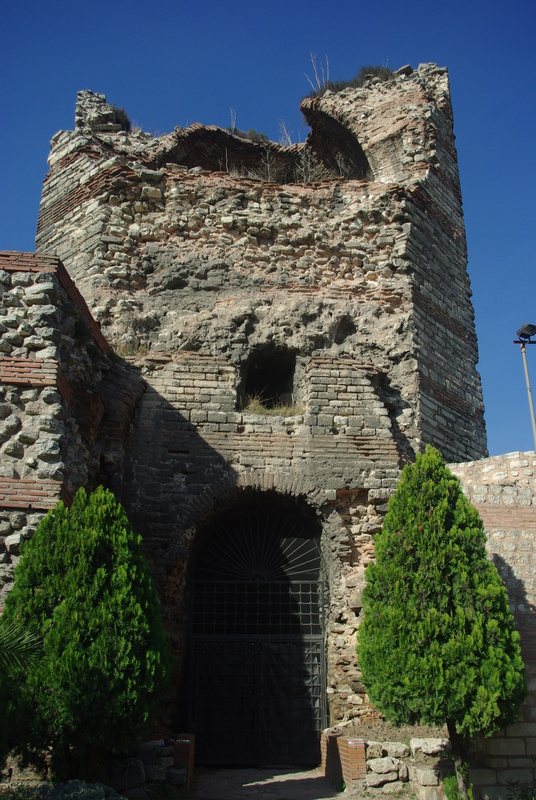 As we walked we also saw one of the old city walls which stood on the city side of the wall, punctuated by towers, old gates and sometimes crumbling stone. We were also treated to the sight of a car trailing rollerbladers who were holding on to whatever bit of car they could reach, and somehow managing not to get run over, all the while shouting excitedly. Once we reached Galata bridge we turned back to make our way to the familiar Sultanahment area where our hotel was, making a few deviations along the way. I say deviations, but in reality it may have been more like getting lost, and wandering through dark streets and markets in the hopes that we could find a street going left. We made it in the end, and to celebrate had dinner at a restaurant next to the cistern. It was very good, including the by now ubiquitous restaurant cats, and so full of food and a day of wonderful sights, we returned to the hotel and a good night’s sleep. 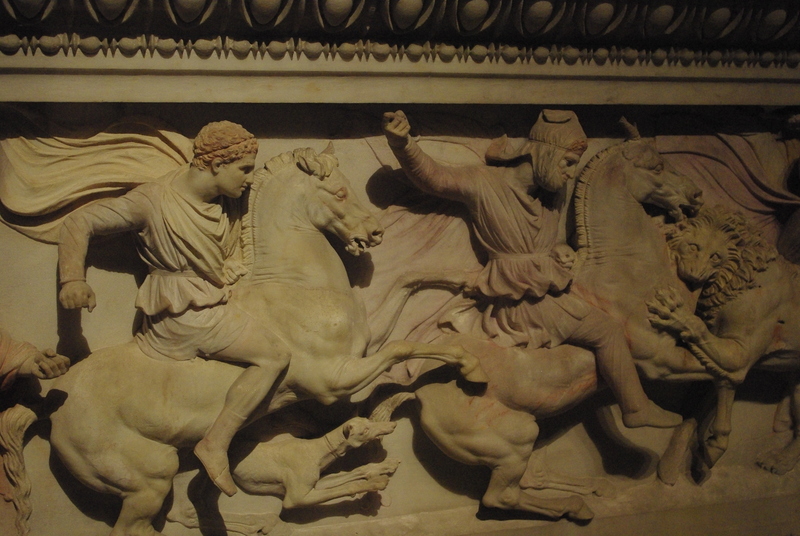 Next time, the Archaeological Museum, Topkapi Palace, and we go slightly off the itinerary!